It’s officially spring, and with the warmer weather and sunny days comes Mother’s Day and Fathers’ Day — two holidays neither consumers nor brands can afford to overlook. Mother’s Day spending topped $23 billion last year as 86% of Americans celebrated the day. On average, Mother’s Day shoppers spent $180 on gifts in 2018, which ranged from jewelry to flowers and special outings like dinner and brunch. Preparations for Father’s Day are similar. Father’s Day shoppers spent $133 per person last year — a little less than mom — amounting to roughly $15 billion in sales as 77% of Americans celebrated dads. Most shoppers (39%) made their purchases at department stores, while 33% went online, 25% visited discount stores, and 23% shopped at speciality stores. With a little lead time, your brand can make the most of these holidays to positively impact your retail sales. When you know where and when to find those gifters, you can use visitation data and location-based targeting to provide messaging and offers that help them celebrate these special days. Step one in reaching these holiday shoppers and capitalizing on the first big gifting moments of the year is to identify who you should be targeting. Cross-referencing this data with what shoppers buy gives retailers the best chance at converting consumers into customers. For example, our foot traffic analytics data shows that during the gifting time frame, department store shoppers were +454% more likely to be Jewelry Shoppers. We also know there’s a strong correlation between Movie Goers and department store shoppers, as movie goers were 366% more likely to buy gifts at such a store. Interestingly, Pet Lovers increase their foot traffic to department stores by +387% around Mother’s Day and Father’s Day. This presents an opportunity to reach and influence those shopping for Pet Moms and Pet Dads. Other GroundTruth Location-Based Audiences that over-index at department stores this time of year include Fast Fashion Shoppers (+448%), Golfers (+395%), Children’s Store Shoppers (+379%), Live Event Attendees (+373%), and Sports Enthusiast (+371%). Knowing this gives retailers the insight they need to target consumers while they’re actively shopping for gifts. It’s clear that consumers have good intentions when it comes to shopping for gifts, but busy schedules make it difficult to plan ahead for May 12th and June 16th. GroundTruth research shows that consumers tend to shop at the last-minute. What this means is that foot traffic to brick-and-mortar retailers increases as these holidays approach. That’s an opportunity for brands to connect with high-intent shoppers and maximize their May and June retail sales. Foot traffic to card stores was up 81% the day before Mother’s Day last year, while visits to electronics stores the day before Fathers’ Day exceeded the average by 42%. Whether shopping for their moms or dads, consumers also visited department, jewelry, and party supply stores immediately prior to the holidays. 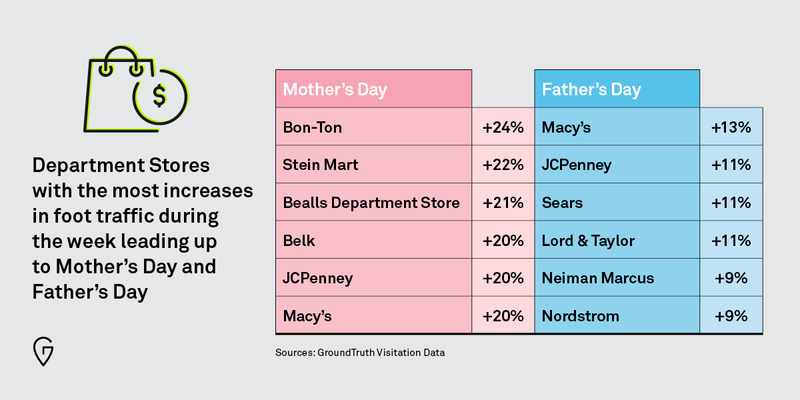 The department store retailers most likely to see an increase in foot traffic during the week leading up to both holidays range from Bon-Ton and Stein Mart for Mother’s Day shoppers to Macy’s and JCPenney for Dad shoppers. In the four days immediately before Mother’s Day, you’ll find shoppers at Jared the Galleria of Jewelry, which gained almost +25% in foot traffic last year, and Pandora Jewelry, which saw a +22% increase. For Father’s Day Shoppers, the electronic stores of choice for during this time period were the Microsoft Store (+20), Best Buy Mobile (+18), Best Buy (+13), the Apple Store (+13), and Gamestop (+12). With so many consumers making both early and last-minute purchases at physical retail stores, it stands to reason that an effective way to reach them is with location targeting. Location Audiences. By applying these to your marketing campaigns you can leverage real-world retail foot traffic analysis to drive shoppers to your stores. Proximity (via Radius). This allows brands to reach audiences when they’re near key points of interest, so you can deliver gift ideas while also encouraging shoppers to keep your store in mind. Behavioral Audiences. 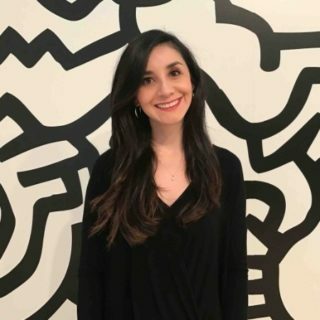 Inspire and convert high-intent shoppers by making sure your brand connects with likely customers, increasing ad efficiency, and boosting brand engagement. Learn more about all of our location-based targeting solutions here.